Now we're riding it Holiday Style! Wear Christmas colors, put your jingle bells on, or even decorate your helmet. Or, get your Scrooge on and come as you are! Grocery stores are so overrated! Pedal with us this Saturday for a fun weekend ride that will leave your taste buds and souls enriched and support our wonderful Houston Farmers Markets. Did you know many of our local restaurateurs’ shop at our Houston Farmers' Markets each week? There they find the best handcrafted cheeses, local produce, baked goods and locally sourced organic meats, and you can too! Our mission is to pedal fast enough to beat them before they take all the goods in the market, but slow enough to enjoy every revolution of the ride. We’re experts at finding the perfect balance! We’ll meander our way down side streets, trails and residential areas you never knew existed in the heart of Houston. First, we’ll wake ourselves up with the delicious aroma of a leisurely Onion Creek coffee. After our caffeine kicks in, we’ll cruise off to the markets to shop for fresh produce, sauces, jams and delicious baked bread. This 12-15 mile ride lasts about three hours, so bring plenty of water and a backpack to carry all your goodies home! Plan on sticking around after the ride to enjoy lunch at Onion Creek Cafe. They are a locally owned eatery with great food, atmosphere, brews, and friends! B-Cycle Kiosk: Looking for the quickest rental option? B-Cycle allows you to rent via mobile app. There are many stations around town to pick up and drop off your rental. Check their map and pricing options information here: http://houston.bcycle.com . Bike Barn: Prefer a person to person transaction and/or a faster bike? Then you should check out Bike Barn. We love their rental shop at their Bayou location: 105 Sabine St. Houston, Texas 77007 on Buffalo Bayou at Hidden Lake. 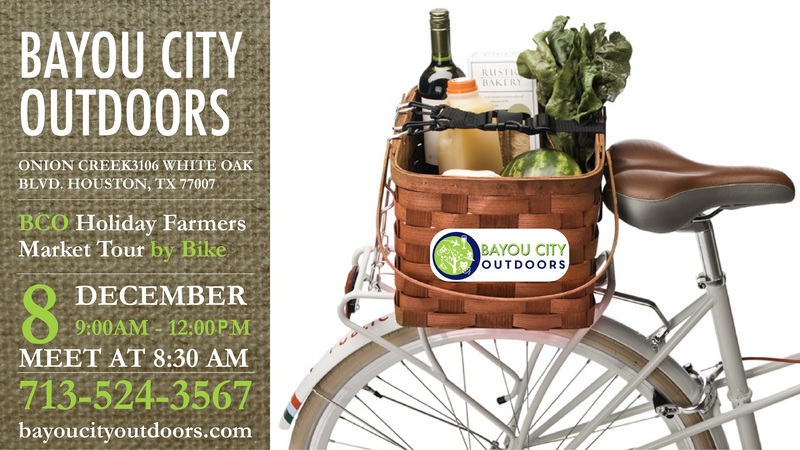 BCO Member Gear: If you are a member of Bayou City Outdoors and do not have a bike, we can loan you a bike for the ride. However, you MUST call the office 1 to 2 weeks in advance to arrange for the loaner bike. Onion Creek, 3106 White Oak Dr., Houston, TX 77007. Please DO NOT park in the Onion Creek lot – there is parking on the surrounding streets, but look out for ‘no parking’ signs. Meet at 8:30 AM – Our ride will go from 9 AM to noon. This event is FREE for members and non-members alike. This event is open to older kids who have good bike handling skills. Please note - we will be riding on some busy Houston streets. Get your copy of Houston A to Z while it lasts-today! You'll find 8 pages of the coolest, the most curious, the gems, and the underground of our town. It's everything you need to know to be a Houston aficionado, and it's completely FREE - http://bit.ly/2gCCaIy .